Zenfolio and SmugMug have similar specialization and are direct competitors. They are used to create multifunctional portfolio websites. Such websites allow demonstrating and selling digital products (photos/videos). Although we have advertising relationships with these website builders, but that has no impact on the comparison. The target audience of the systems includes photographers of all levels, irrespective of their skills and expertise. These services are almost identical in their functionality. Minor distinctions exist, of course, but we’ll put the emphasis on the ease of use when comparing Zenfolio and SmugMug. This is the most crucial comparison parameter in this case. The cost of the systems ranks second on the comparison list of the most important criteria. Let’s analyze the most crucial aspects of both services to decide, which system is the leader – Zenfolio or SmugMug? Zenfolio comes with a logically structured interface, the design of which may not appeal to everyone. The dashboard structure is quite complicated. It’s possible to master it and get used to it, but not right from the start. Web page design creation is the most inconvenient stage here. The editor lacks informational value: you won’t understand how the changes you make will affect the design until you confirm them. Rich customer support section compensates for the interface inconvenience a bit. The service works well for newbies and web design pros, but you shouldn’t hope for a quick start. Instead, you’ll have to explore the system and learn the basics of it. The complexity rate is above the average. SmugMug has extraordinary interface. It is appealing, stringent and comes with nice ergonomics. The system will offer tips throughout the testing process, which simplifies it for newbies. A user with insufficient experience will master the service options in around 2-3 hours. FAQ fans will also appreciate the extensive availability of educative text and video materials. Generally, the complexity of mastering/using the system is on the average level. Zenfolio vs SmugMug. Both systems make it possible to complete identical tasks, but the web building experience you get when using the systems somewhat differs. SmugMug generally has a simpler and more ergonomic interface, which is especially manifested in the web page editor features. It is easier to master and use it. However, both systems can boast the availability of tips and FAQ sections, which will be of great help to many users. The services require attentive approach. They are specific, but it’s still simpler and quicker to explore SmugMug. 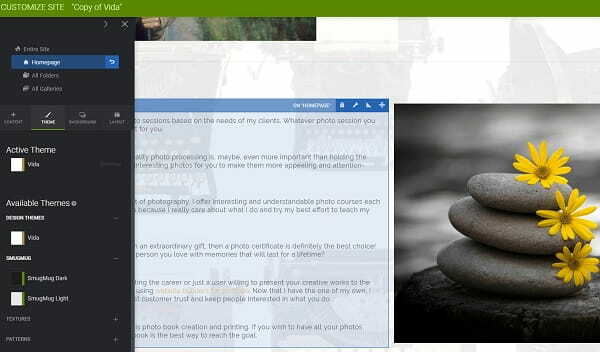 Zenfolio allows creating an appealing portfolio and adding a blog to it. You can also sell photos/videos here, that is, the service supports the full-fledged eCommerce functionality (shopping cart, online payment acceptance, taxes, discounts, promo actions, bills etc.). You can upload the unlimited number of photos, including those is the RAW format (files up to 60 MB). For $50/year, you can connect the RAW Files Edit service for convenient photo editing within the system. «Communications» section contains the contacts of all the registered users, correspondence and shopping history, comments and other useful data. Versatility of layouts for web pages and separate blocks should also be pointed out here. This feature will give your portfolio unique design. SmugMug pays much attention to structure customization and design of a portfolio. Visual editor comes with drag-and-drop support, which is a notable benefit. You can edit photos by using integrated system tools (effects, cut and rotate options etc.) or connect Lightroom and work with it. There is a possibility of adding watermarks to the photos as well as location and SEO data. You can also use widgets (text, gallery, share buttons, logo, map, calendar etc.) by dragging them to the pages. The service offers a powerful set of eCommerce tools, namely price lists, discount coupons, product packs, sales ets. All these tools come with flexible customization options. Zenfolio vs SmugMug. The functionality of the services is almost similar, but SmugMug has a better design editor, more billing settings and an option that allows connecting Lightroom to edit the photos for free. These are notable advantages. Even though, Zenfolio looks more powerful, it still doesn’t come up to the competitor’s level. SmugMug is the leader in this comparison part. Zenfolio offers 12 templates of good quality. All of them work great for photo display. Design customization is powerful here due to the ability to change layouts in different parts of a web page. This allows giving a website individual look. You can also change the background, typography, color scheme of a website and choose the elements that will be visible on a web page (buttons, links, blocks). Generally, template quality and customization options are on a decent level here. SmugMug offers 29 ready made templates (8 of them are available from the start and the rest are provided after the upgrade to the “Power” plan). All of them are responsive and have modern stylish look. You can add new blocks to any template, change the background (slideshow and video), color scheme, spacing between the blocks etc. There is an opportunity to add sidebars to a template and edit HTML/CSS code. Gallery styles can be changed as well. Output of photos, the resolution of which is up to 4000, is supported as well. Generally, the service offers nice design customization options. Zenfolio vs SmugMug. Both systems make it possible to get appealing design. Web page editor is more convenient in SmugMug, because it supports drag-and-drop functionality and widgets: you can drag an element to the page, click on it and start editing the content (text, links, photo, button etc.). This is realized in a more convenient way. Template quality is almost identical. Zenfolio has a rich choice of layouts, which allows setting versatile website structure. 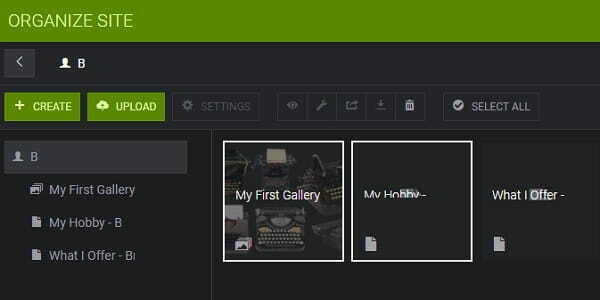 SmugMug makes it possible to change gallery style and edit the code independently from a template. These are obvious benefits. Basically, both services provide similar design options, but SmugMug has somewhat better features. Zenfolio offers customer support via email and live chat options. You will get an opportunity to contact a service manager by phone, having upgraded to the Advanced Plan. Right after the registration, you can communicate with a manager in a live chat, which will help you master the service in a more effective way. The Support Center contains a rich amount of quality educative materials in the text and video formats. There is also a forum with a long list of topics. SmugMug may offer great educative materials subdivided into categories to simplify the search. There is the YouTube channel with a rich amount of videos covering all the system nuances. Communication with tech support is done through the contact form and email. Zenfolio vs SmugMug. Both systems are almost equal in terms of quality and quantity of educative materials. Tech support is great in both services as well, but Zenfolio has more contact options, including the phone. This is an advantage. Both platforms are commercial. There are no free plans here, but they offer a 14-day trial to test their features. To keep working with the systems, you need to upgrade to any of the paid plans. The cost of services differs up to 20%. SmugMug is cheaper. The cost of using both systems will be around 40% lower granted that you make a one-time yearly payment. Listed below are the monthly rates. Thus, the pricing options of both website builders are almost similar, with a 20% cost difference. Benefits enlisted in the plan descriptions may somewhat differ, but the essence is the same: you need an advanced plan to run your business effectively, because only these plans ensure maximum eCommerce features. It’s worth mentioning that both systems occasionally offer promo actions with discounts up to 40-50%. You’ll also save up to 40% when making a one-time yearly payment. There is much to think about here. Zenfolio vs SmugMug. SmugMug is a more cost-efficient system. It is not about the cost of plans only. Zenfolio additionally charges a 7% transaction fee from each sale. This is a notable disadvantage. Apart from that, SmugMug allows connecting Adobe Lightroom for free. The cost of using the photo service in Zenfolio constitutes $50/year. Why pay more? Zenfolio and SmugMug have minor functional distinctions. The use of the systems ensures similar results, allowing to make quality and visually appealing portfolios with an online store. However, the approach to working with the platforms differs a lot, which is manifested in the dashboard interfaces and web page editors. Zenfolio interface structure is more logical, while SmugMug has a more convenient visual editor and HTML/CSS code editing options. Tech support of both systems is almost on the same level with a minor Zenfolio privilege. The cost of plans, template mobile optimization, interface design are all the SmugMug benefits. Having considered all the factors reviewed, we give preference to SmugMug. It is generally more affordable and easy-to-use.